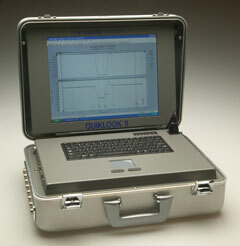 Teledyne Test Services’ QUIKLOOK IIis a self-contained system used to test both air-operated and motor-operated valves. It captures data from Teledyne QSS and SMARTSTEM sensors as well as any other strain-gage or voltage-based transducers. The Teledyne sensors provide continuous direct torque and thrust data from the stems of valves undergoing diagnostic testing. QUIKLOOK IIcollects data at rates up to 10K samples/sec and allows the user to view up to 16 channels of valve test data simultaneously on a 15” active matrix color display. The QUIKLOOK IIsystem has 10 input ranges, from +/-20 mv to +/-10.24 V. The software has enhanced triggering functions; setup, test, and replay options; trace marking and annotation capability, real-time viewing of channel data and automated report generation. The QUIKLOOK IIsoftware is integrated with Microsoft Access for full database manipulation of marker data and full trending capabilities. Data from different tests can be synchronized to a common marker. QUIKLOOK IIalso has a sentry mode for unattended valve monitoring.